Wondering on the shore, camera in hand, the enjoyment of being there is always enhanced with wildlife. I have favorite birds, and tend to shoot these more often. Here are few pictures of the birds that were around when I was shooting all those sea stacks (see below). 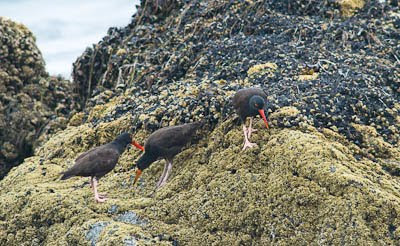 Oystercatchers are always great to have around. 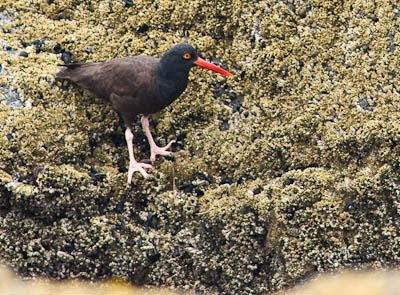 First, they have a very distinct appearance with their black bodies, white legs, orange bills and intensely orange eyes outlined in red. They are also quite vocal, with a chattering call that can be heard for a very long distance. They are also very social birds, and usually travel in groups. The largest group I have seen so far was at Cape Flattery, with as many as 80 Oystercatchers together there (look for future post). Another favorite are Pelicans. When we were here at Harris Beach two years ago, there were literally thousands of California Brown Pelicans. This year showed much lower numbers, but still enough to observe and enjoy. Some were hit hard last year, and were found far inland, seemingly disoriented. Others were washing up on the beach. Many believe, as is years past, that they were victims of pesticides. 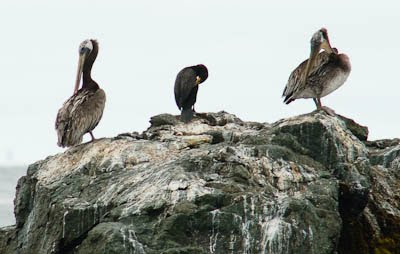 Here are two drying and pruning offshore, joined by a Double-crested cormorant.